Chances are you’ll have a bottle of tomato ketchup in the cupboard or fridge. Many of the bottles are now the plastic squeezy type. 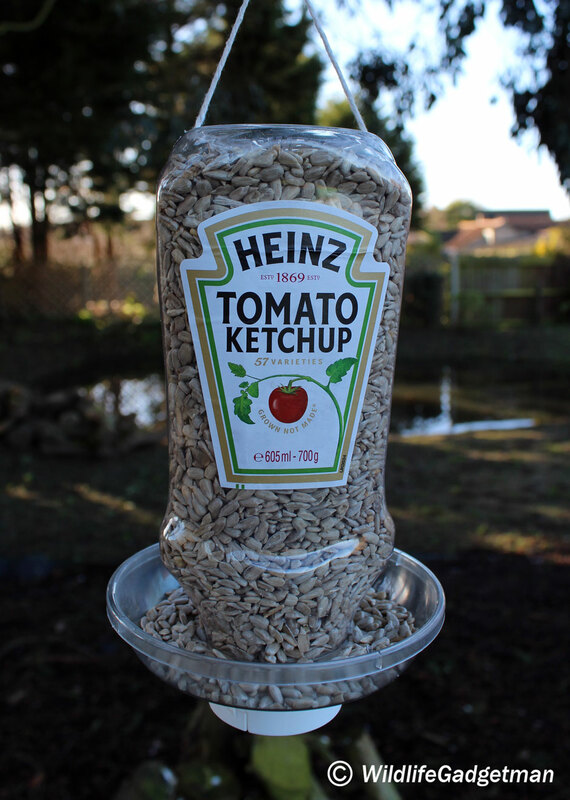 Rather than simply popping the empty bottle in the recycling bin next time you finish a bottle why not have a go at ‘upcycling’ it into a great hanging bird feeder. 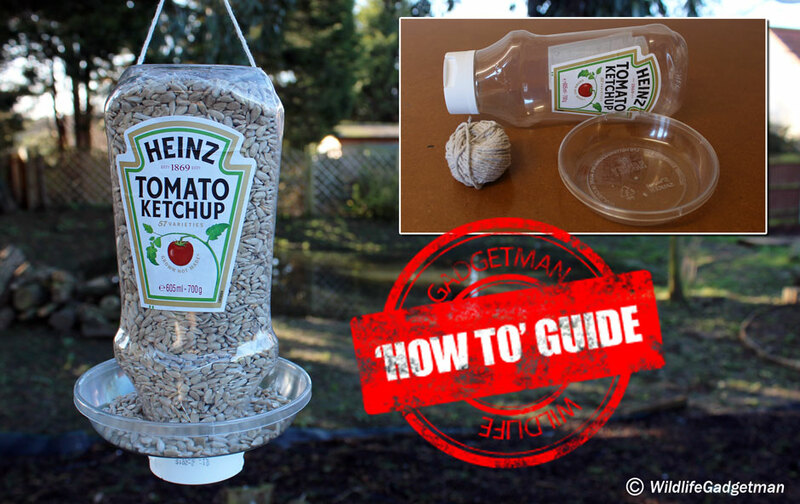 I’ve found that the 700g Heinz squeezy tomato ketchup bottle works really well for this project but there are similar bottles available. 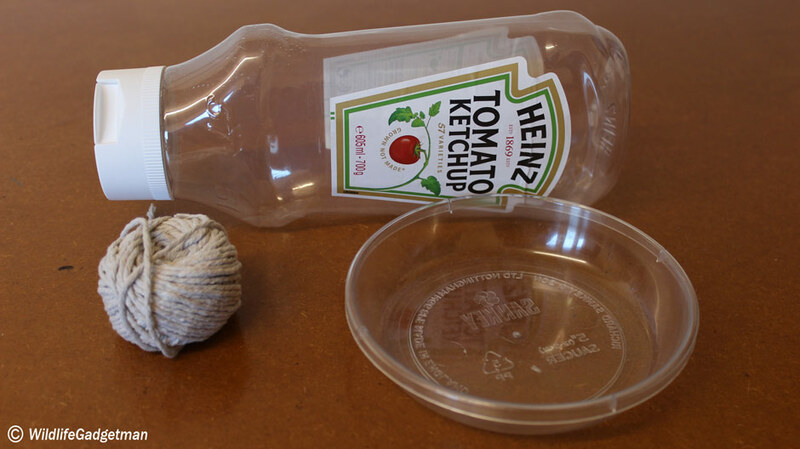 Make sure the bottle is washed out thoroughly to remove and ketchup residue. Attach a 38mm dia. 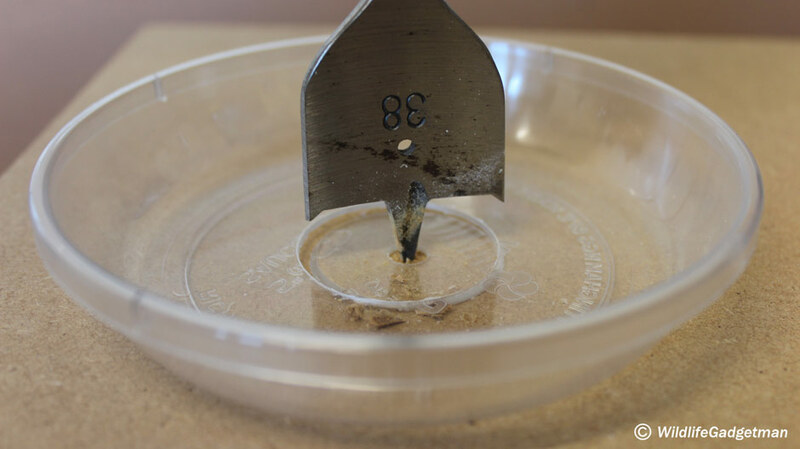 drill bit to your drill and drill a hole in the centre of the plastic plant pot drip tray. 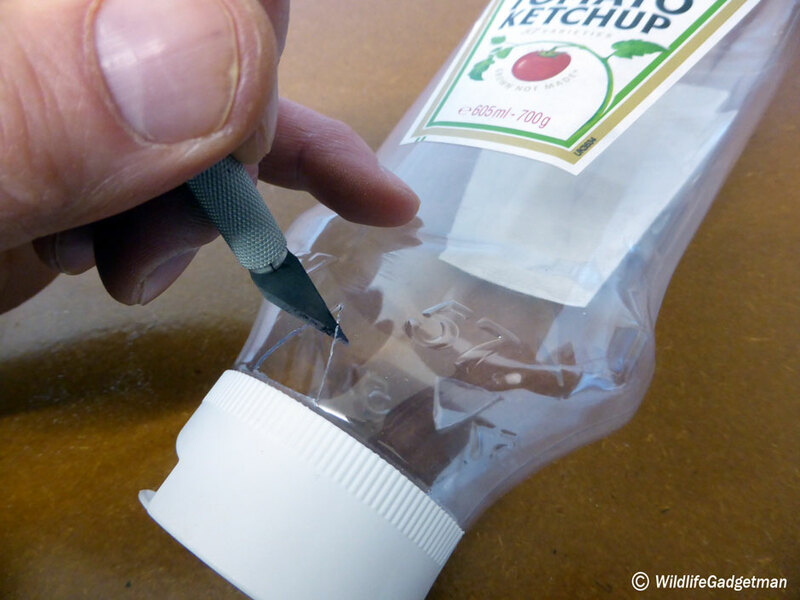 Using a sharp craft knife create four holes evenly spaced around the top of the bottle. I’ve found that a triangle shaped cut out works really well. 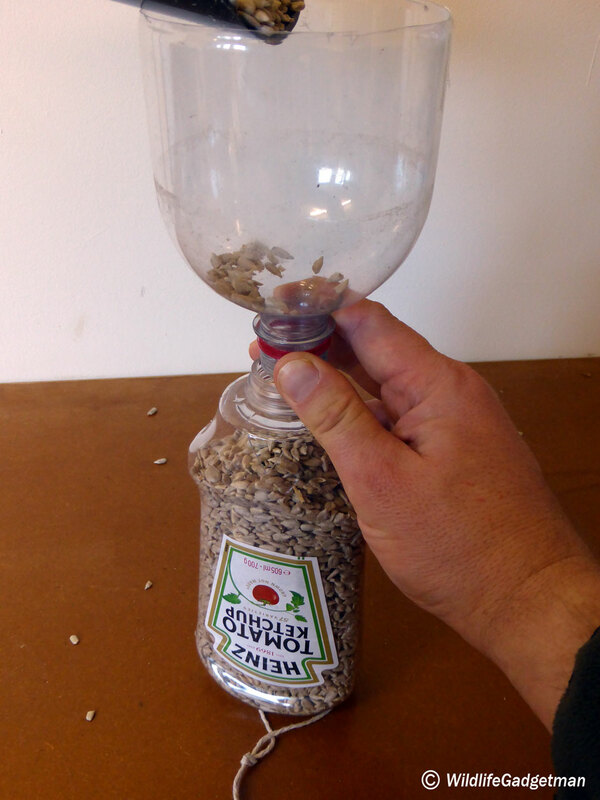 Fit the seed tray over the top of the bottle and screw the bottle lid back on to make sure it all fits together. Remove the cap and tray again ready for the next stage. Using a 4mm dia. drill bit drill two holes in the base of the bottle in preparation for adding the hanging string. Cut a piece of string and push each end through each hole you have just drilled. 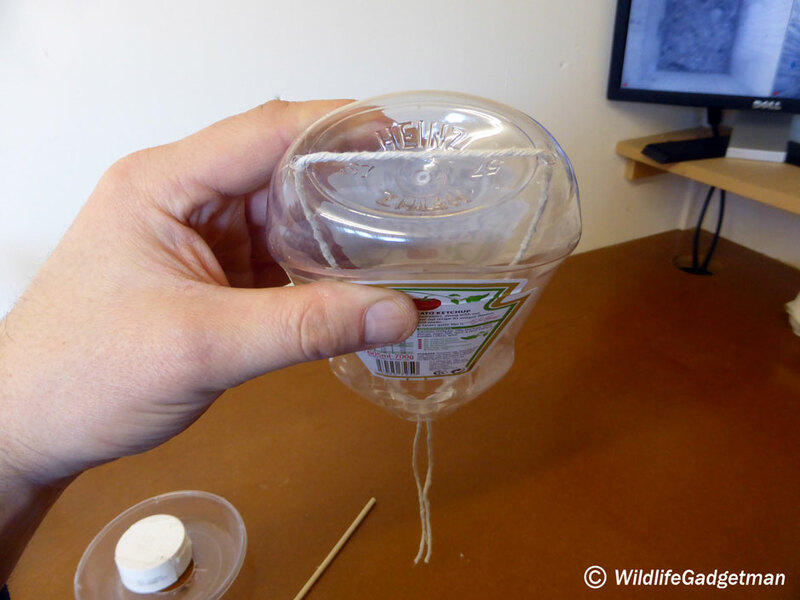 Make sure the string is long enough so both ends hang out of the bottle opening by at least 10cm. 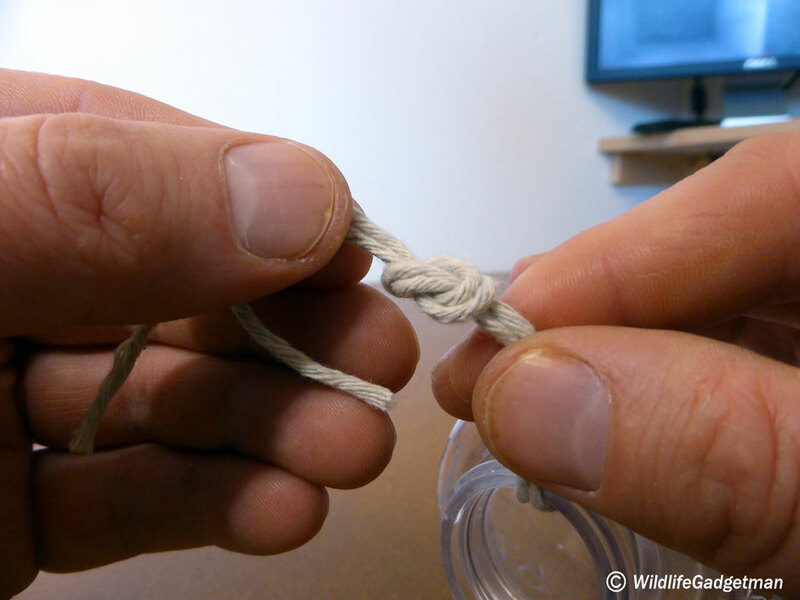 Tie the ends of the hanging string together in a tight knot and then pull the knot inside the bottle to create the hanging loop. You could also add a little silicone sealant, blue tac or glue from a hot glue gun in and around the holes to help make them a little more watertight. Fill your feeder with your garden birds favourite bird food. 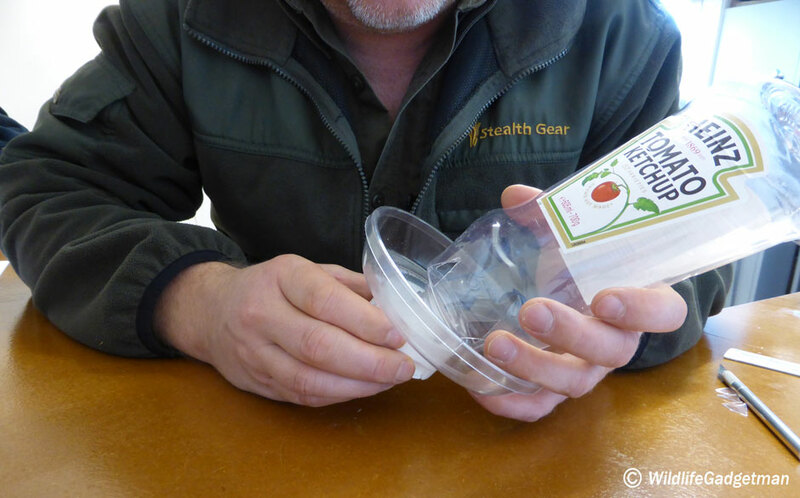 Use the top of a fizzy drinks bottle as a funnel to help make filling your feeder a doddle. 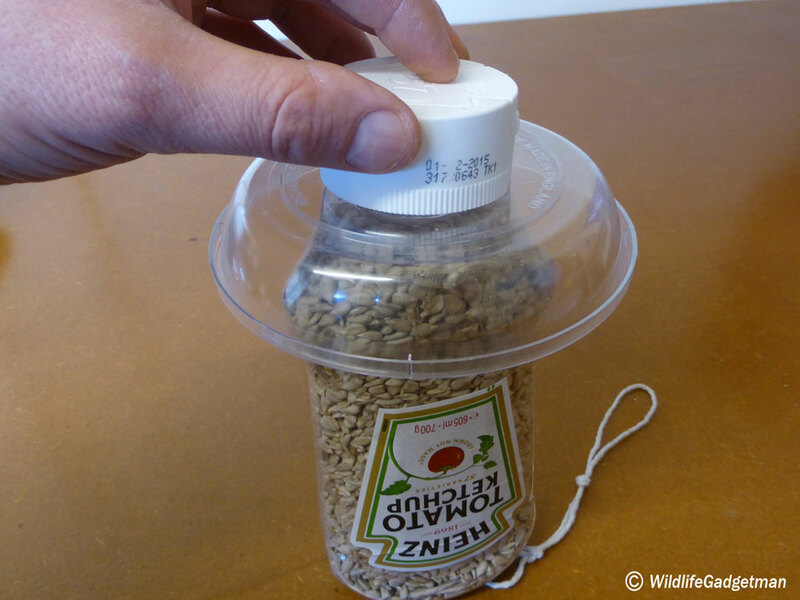 Attach the seed tray and secure in place using the bottle cap. All that’s left to do is hang your new feeder in the garden and wait for the birds to arrive! As always, I would love to see your creations too! Feel free to share your photos and stories with me via Twitter or my Facebook page. This looks a great idea! I find there is a lot of wastage using the traditional feeders that have plastic tubes with ports (even with trays attached) so will give this a go. Thanks Paul. Let me know how you get on. I will have to try this one, my son get through lots of ketchup. Other brands are available. Looks good, just one thing, I would drill three or four small holes at the base about half an inch away from the cap, to help stop any water build up. What about water proofing the holes for the string with some silicone? Would it still work? Great idea Lina. I’ve tweaked the guide to include that suggestion. Genius! Absolutely love it! Will definitely be doing this at school with my Eco Warriors. It might be an idea to fix another or slightly bigger drip tray on the top to stop rain filling up seed tray. Ingenious! Clever and pretty easy! Thanks..